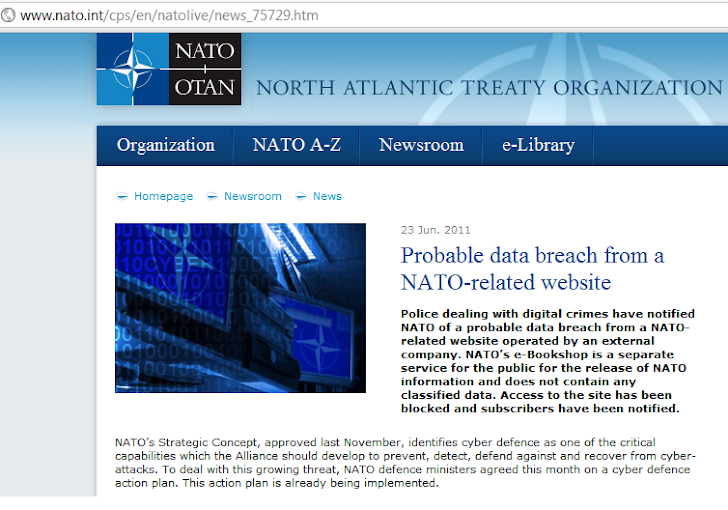 The North Atlantic Treaty Organization (NATO) has just issued a short statement that reads as follows: "Police dealing with digital crimes have notified NATO of a probable data breach from a NATO-related website operated by an external company. NATO's e-Bookshop is a separate service for the public for the release of NATO information and does not contain any classified data. Access to the site has been blocked and subscribers have been notified." It's unclear whether Anonymous is behind this attack against NATO's e-Bookshop or LulzSec did this for "Operation Anti-Security" . Stay Tuned for Updates .